amazing historical dress which i adore totally! its sculptural look that is just too surreal, by all means. This evening dress is particularly rare and unusual in that it fully incorporates what were viewed as classical elements of the period. The strongest classicizing detail of the gown is in its densely gathered silk, a technique that conjures the wet-drapery of classical statuary. 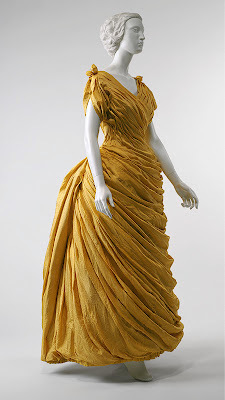 The gown's internal structure, with a wasp-waisted corset and bell-shaped underskirt, conforms to the fashionable hourglass silhouette of the period, its surface is intended to replicate the articulated folds that characterize classical renderings of drapery. This softly gathered surface would also have conveyed a tantalizing "naturalism." The consequence is an impression of the female body as less confined by the rectitude of a precise and controlled tailoring.